Youth coaches in TN must have a coaching license depending on the division in which they are coaching. A one year, once in a lifetime waiver may be granted for coaches without the required licensing level to coach a team. Exceptions and additional deferments may be granted following a written request from a coach under exceptional circumstances at the discretion of the State Director of coaching AND the Executive Director. 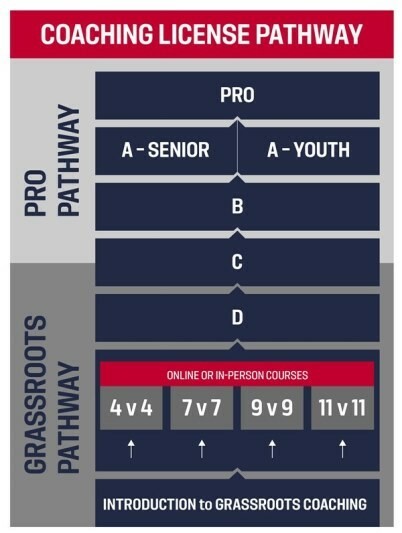 Changes to the US Soccer Federation coaching education pathway implemented in 2018 are explained here: including recognition of licenses obtained in previous formats. If you are currently hold a US Soccer E or National D license that was issued by The TN State Soccer Association please register with the US Soccer Digital Coaching Center, Once you have registered with the Digital Coaching Center and entered your license details, TN State Soccer will be able to verify your licenses and you can print copies from the DCC. (Please note, only candidates who received a National grade for their D license will be able to upload details on the DCC and be eligible to move onto the US Soccer C License). Coaches obtaining USSF licenses from other state soccer associations can also upload their license details, but those can only be verified by the issuing state association. Coaches in TN must have the minimum coaching license depending on the division they are coaching. No Requirements. Recommend in person or online module for game format being coached. It is highly recommended that coaches complete the online education module course offered by US Soccer BEFORE taking the in-person requirement. Please note a $25 charge is incurred in the DCC payable to US Soccer to access an online course. A USSF Coaching license is granted after completion of all online modules except the free Intro to Grassroots coaching course. Online courses are available through the US Soccer Digital Coaching Center( DCC). Course fees are payable directly to US Soccer. The US Soccer Federation does not grant waivers into the coaching education pathway to coaches holding any other US soccer affiliate coaching certificates or diplomas. The US Soccer Federation does not recognize foreign grassroots coaching licenses as equivalencies to bypass US Soccer coaching education pathway levels; The TSSA recognizes credentials from other recognized coaching education organizations to meet coaching license requirements at different divisional levels in Tennessee. U.S. Soccer also recognizes certain licensure from other federations or confederations as a means to begin at the C or B course level. The decision to recognize certain foreign licensure belongs to U.S. Soccer and is subject to change. For information regarding licensing waivers, please visit www.ussoccer.com/coaching-education/faq or contact US Soccer directly.